Monkey don't see, now Monkey see. Hello, and welcome to my page. I'm MuddyMonkey; a 20-year-old Student who can kinda' draw (O.K, I'm not very good in the grand scheme of things), but my main passion is writing stories. I've been in the Fandom a fairly short amount of time; only about a year and a half at most, but truth be told, I'm mainly interested in the art/writing side of the Furry Fandom; heck, I haven't even been to any sort of meet-up, let alone Convention before. Anyways, my non-furry interests are mainly cars; I love Japanese cars, in particular Toyotas, and aside from that, I'm also quite a big fan of Sonic the Hedgehog (I know, that's fairly taboo these days in a culture where it's seen to be "cool" to hate Sonic, but I do dislike the Boom franchise, so there's that xD! ), with my favourites in the series being Adventure 1, Generations, and Colours in no particular order. I don't actually have a fursona, as such; rather I just like to create many different characters, and I don't feel any sort of attachment to one particular animal, at least not enough to create an anthro representation of myself. That being said, monkeys are my favourite animal to be 'anthropomorphicised' (is that even a word? 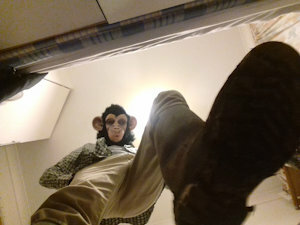 ), hence why the species appears in my profile name; my "main" character is also a monkey. Due to academic work, my upload schedule is...non-existant, to be frank; I'll upload various drawings and stories when I find the time.